O holy Pontiff, thy faith, removing mountains and commanding the waves, was a justification of our Lord’s promise. Teach us in our turn to do honor to the Gospel, by never doubting of our Lord’s word and of the help he promises us against Satan. Grant, we beseech thee, O Almighty God, that the venerable solemnity of blessed Gregory thy Confessor and Bishop, may improve our devotion, and strengthen in us the hopes of salvation. Through our Lord Jesus Christ, thy Son, who liveth and reigneth with thee, in the unity of the Holy Ghost, God, world without end. Amen. Moses instructed in all the wisdom of the Egyptians, mighty in his words and in his deeds (Acts, vii. 22), retired into the desert: Gregory, adorned with the best gifts of birth and nature, brilliant in rhetoric, rich in every science, hid himself from men in the flower of his youth, and hastened to offer to God in solitude the holocaust best pleasing to the Lord. Each was the hope of his race; yet each turned away to lose himself in the contemplation of heavenly mysteries. Meanwhile, the yoke of Pharaoh lay heavy upon Israel; meanwhile, souls were perishing, whom one of Gregory’s burning words might have snatched from the empire of idolatry: was not such flight, then, desertion? Is it for man to proclaim himself a saviour, when Jesus did not arrogate that title to himself? And when evil was rife all around, did the Carpenter of Nazareth do wrong to remain in the shade for thirty years previous to his short period of ministry? O ye teachers of our excited, fevered times, who dream of a new hierarchy among the virtues, and understand divine charity far otherwise than did our fathers: not those are of the race of Israel’s saviours whose ideas concerning social good differ from those of the world’s Redeemer. This was the message our Saint was to communicate to his country, the creed that was to bear his name in the Church. By his faith in the most holy Trinity he was to remove mountains, and set limits to the waves, to drive out Satan, and eradicate infidelity from Pontus. When, towards the year 240, Gregory, then bishop, was on his way to Neocæsarea, he saw on all sides the temples of idols, and stopped for the night at a famous sanctuary. In the morning all the gods had taken to flight and refused to come back; but the Saint gave to the priest of the oracle a note thus worded: Gregory to Satan: return. A more bitter defeat awaited the demons; forced to stay their precipitate retreat, they were compelled to witness the ruin of their empire over the souls they had abused. The priest was the first to give himself up to the Bishop, and became his deacon; and soon upon the ruins of the temples everywhere overthrown arose the Church of Christ, the only God. Happy was that Church, so firmly founded that heresy was powerless against it in the following century, when so many others bowed before the storm of Arianism. On the testimony of St. Basil, the successors of St. Gregory, themselves eminent men, were as an adornment of precious stones, a crown of stars, to the Church of Neocæsarea. Now all these illustrious Pontiffs, says he, considered it an honor to keep up the memory of their great predecessor; they would never suffer that any act, word, or movement other than his, in performing the sacred rites, should prevail over the traditions he had left. When Clement XII,… established in the entire Church the feast of St. Gertrude the Great, he at first decreed that it should be kept on this day, on which it is still celebrated by the Order of St. Benedict. But as the 17th of November had been for long centuries assigned to St. Gregory Thaumaturgus, it seemed unfitting, said Benedict XIV that he who moved mountains should himself be moved from his place by the holy virgin. Accordingly in 1739, the year following its institution, the feast of St. Gertrude was fixed on the fifteenth of this month [and then moved to 16th of November, in 1931, following the canonization of St. Albert the Great]. Let us read the brief account of the great Thaumaturgus given in the holy Liturgy. Gregory, bishop of Neocæsarea in Pontus, was illustrious for his holiness and learning, but still more for his miracles, which were so startling and so numerous that he was called the Thaumaturgus; and, according to St. Basil, he was considered comparable to Moses, the Prophets, and the Apostles. By his prayer he removed a mountain, which was an obstacle to the building of a church. He also dried up a lake which was a cause of dissension between brothers. The river Lycus, which was inundating and devastating the fields, he restrained by fixing in the bank his stick which immediately grew into a green tree, and served as a limit which the river henceforth never overpassed. He frequently expelled the devils from idols and from men’s bodies, and worked many other miracles, by means of which he led multitudes to the faith of Christ. He also foretold future events by the spirit of prophecy. When he was dying, he asked how many infidels remained in the city of Neocæsarea; and on being informed that there were only seventeen, he gave thanks to God, and said: When I was made bishop, there were but seventeen believers. He wrote several works, by which, as well as by his miracles, he adorned the Church of God. Another account of St. Gregory Thaumaturgus. Theodorus, afterwards called Gregory, and, from his extraordinary miracles surnamed Thaumaturgus, or Worker of Wonders, was of Neocӕsarea, in Pontus, born of parents eminent for their rank and fortune, but engaged in the superstitions of idolatry. At fourteen years of age he lost his father, and from that time began to discover the vanity of the heathenish religion, as his reason grew more quick and manly, and was improved by education; and by this means his inclinations were insensibly turned towards the belief of the unity of the Deity and the Christian faith. His mother pursued the plan begun by his father in giving him a literary education, with an intention of bringing him up to the bar, and the practice of oratory. In the study of rhetoric he made such surprising progress, that it was easy to foresee he would one day be one of the greatest orators of the age. He learned the Latin tongue, which was a necessary qualification for preferment to great dignities in the Roman empire: his masters also persuaded him to study the Roman laws, an acquaintance with which they said would be a great advantage to him in whatever profession he should afterwards embark. His sister being married to the assessor, or assistant of the Governor of Cӕsarea, in Palestine, she was conducted thither at the public charge, with such as she was disposed to take with her. Gregory accompanied her upon this occasion, with his brother, Athenodorus, who was afterwards a bishop, and suffered much for the faith of Jesus Christ. From Cӕsarea the two brothers went to Berytus, to attend a famous school of the Roman law in that neighbourhood. After a short stay there, they returned to Cӕsarea. Origen had arrived there a little before, in 231, having left Alexandria to avoid the trouble which Demetrius gave him there. That great man opened a school at Cӕsarea with extraordinary reputation, and, at the first interview with our saint and his brother, discovered in them an admirable capacity for learning, and excellent dispositions to virtue, which encouraged him to inspire them with a love of truth, and an eager desire of attaining the sovereign or chief good of man. Charmed with his discourses they entered his school, and laid aside all thoughts of going back to Berytus. Origen entered upon his course of philosophy with them by logic, which, as laid down by him, taught them neither to admit nor reject a proof at a venture, but to examine an argument to the bottom, without being dazzled at or amused with terms. He then proceeds to natural philosophy, which, as managed by that religious and learned man, led them to consider and adore the infinite power and wisdom of God, and admire the various and beautiful works of the creation with a becoming humility. The mathematics were their next employment, under which astronomy and geometry were comprehended; but all this master's lessons tended to raise the minds of his scholars above the earth, and to warm their hearts to the love and eager pursuit of truth. These studies were succeeded by lectures of morality, and St. Gregory does justice to Origen by assuring us that he excited them to virtue no less by his example than by his discourses; and tells us that he inculcated to them that, in all things, the most valuable knowledge is that of the first cause, and thus he led them on to theology. Upon this head he put into their hands and opened to their view all that the philosophers and poets had writ concerning God, observing to them what was true and what was erroneous in the doctrine of each, and showing them the incompetence of human reason for attaining to certain knowledge in the most important of all points, that of religion, which manifestly appears from the capital errors into which the most considerable philosophers fell, whose monstrous opinions destroy one another, and by their absurdity and inconsistency confute themselves. Having brought them thus far on their way, he clearly set forth that, in what regards the Deity, we can only give credit to God himself, who speaks to us by his prophets, and he expounded to them the scriptures. Gregory and his brother were so charmed with this admirable light, that they were ready to quit every thing that interfered with their design of making God the object of their thoughts. In the mean time the persecution broke out in the East, under Maximian, which obliged Origen to leave Cӕsarea, in 235, and lie concealed that and the two following years. Gregory in the mean time repaired to Alexandria, where then flourished a famous school of the Platonic philosophy, and another of physic. His morals at Alexandria were so strict and regular, that the young students grew jealous of his virtue, and looked upon his behaviour as a tacit censure of their own irregularities. To be revenged, they instructed an infamous prostitute to affront him in the following manner: while Gregory was engaged in a serious discourse with some of his learned particular friends, she impudently went up to him and made a demand of arrears due to her, as she falsely pretended, upon contract for criminal familiarities. Those who knew his virtue were fired with resentment at so base a calumny and aspersion; but he, without the least emotion, desired one of his friends to satisfy her demands, that she might be gone, and their conversation might suffer no interruption by her importunities. This easy compliance made some of his friends suspect him guilty, and begin to reproach him; but God rewarded his patience and meekness by clearing his innocence; for no sooner had the strumpet received the money but she was seized with an evil spirit, howled in a frightful manner, and fell down, tearing her hair, foaming at the mouth, and staring with all the fury and distraction of a fiend. Gregory's charity prompted him to call upon God in her favour, and she immediately recovered. Gregory remained at Alexandria from 235 to 238, when, the persecution being over, he returned to Cӕsarea, and finished his studies under Origen in two years more, so that he passed five years in his school and three at Alexandria—in all eight. Whether he received baptism in this latter city, or after his return to Cӕsarea, is uncertain. Before he took leave of Origen, to testify his gratitude to such a master, he thanked him publicly by an oration which he made before him in a numerous auditory, and which Du Pin calls one of the most finished and elegant panegyrics extant. Gregory and his brother were scarce arrived at Neocӕsarea, but Origen wrote a tender letter to our saint, in which he calls him his holy lord, and his true son; and exhorts him to employ for the service of religion all the talents which he had received from God, and to borrow from the heathenish philosophy only what might serve that purpose, as the Jews converted the spoils of the Egyptians to the building of the tabernacle of the true God, recommending to him the study of the holy scripture, with prayer. At his return his countrymen expected to see great fruits of his studies, the wise and great men importuned him to aspire to posts of honour and authority, and to display his abilities amongst them. But, relinquishing all that he possessed in the world, he retired to a solitary place in the country, there to converse solely with God and his own mind. Phedimus, Archbishop of Amasea, metropolitan of Pontus, cast his eye upon him to raise him to the episcopal dignity, judging that his ripe parts and piety more than made up for his want of age. The good man, hearing of this, shifted his quarters, and no sooner was he sought for in one desert but he fled to another. However, at length he compounded that a delay should be allowed him to prepare himself for that sacred character; after which he received the episcopal ordination with the accustomed ceremonies. About the same time he received and committed to writing the famous creed or rule of faith, concerning the mystery of the Holy Trinity, which is extant in his works, and of which we have in Lambecius a most valuable ancient Latin translation, published from a copy which was sent by Charlemagne a present to Pope Adrian I. St. Gregory of Nyssa assures us that this creed was delivered to the saint by the Blessed Virgin and St. John Evangelist, in a vision, which he relates as follows: One night, whilst St. Gregory was taken up in a profound meditation on the mysteries of our holy faith, a venerable old man appeared to him, and said he was sent by God to teach him the truth of the holy faith. A woman stood by, who appeared above the condition of what is human, and, calling the other by his name, John the Evangelist, bade him discover to the young man the mystery of the true religion. He answered that, seeing it was the desire of the mother of our Lord, he was ready to do it. He then delivered the doctrine by word of mouth, which Gregory committed to writing, and the vision immediately disappeared. 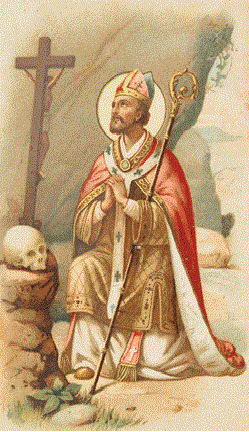 St. Gregory made this creed the rule of his preaching, and left the same a legacy to his church, which, by following it, has to this day, says St. Gregory of Nyssa, remained free from all heresy, namely, of the Arians and Semiarians; for this creed clearly explains the doctrine of the Holy Trinity. St. Gregory of Nyssa testifies that in his time the original copy was preserved in the archives of the Church of Neocӕsarea; it is quoted by St. Gregory Nuzianzen, Rufinus, &c.
The city of Neocӕsarea was rich, large, and populous, but so deeply buried in vice, and so miserably addicted to superstition and idolatry, that it seemed to be the place where Satan had fixed his seat, and Christianity had as yet scarce been able to approach its neighbourhood, though it was in a flourishing condition in many parts of Pontus. St. Gregory, animated with zeal and charity, applied himself vigorously to the charge committed to him, and God was pleased to confer upon him an extraordinary power of working miracles, of some of which St. Gregory of Nyssa gives us the following account. As the saint was returning from the city to the wilderness, a violent rain obliged him to take shelter in a heathenish temple, the most famous in the country, upon account of oracles and divinations delivered there. At his entrance he made the sign of the cross several times to purify the air, and then spent the night there with his companion in prayer, according to custom. The next morning he pursued his journey, and the idolatrous priest performed his usual superstitions in the temple; but the devils declared they could stay there no longer, being forced away by the man who had passed the last night there. After several vain attempts to bring those powers back, the priest hastened after the saint, threatening to carry his complaints against him to the magistrates and to the emperor. Gregory, without the least emotion, told him, that with the help of God he could drive away or call the devils when he pleased. When the idolater saw he disregarded all his menaces, and heard that he had a power of commanding demons at pleasure, his fury was turned into admiration, and he entreated the bishop, as a further evidence of the divine authority, to bring the demons back again to the temple. The saint complied with his request, and dismissed him with a scrip of paper, in which he had written, “Gregory to Satan: Enter.” This being laid upon the altar, and the usual oblations made, the demons gave their answers as usual. The priest, surprised at what he saw, went after the holy bishop, and begged he would give him some account of that God whom his gods so readily obeyed. Gregory explained to him the principles of the Christian faith, and finding the priest shocked at the doctrine of the incarnation, told him, that great truth was not to be enforced by words or human reasoning, but by the wonders of the divine power. The priest hereupon pointing to a great stone, desired the saint to command that it should change its place to another, which he named. St. Gregory did so, and the stone obeyed, by the power of him who promised his disciples that by faith they should be able to remove mountains. The priest was converted by this miracle, and, forsaking his house, friends, and relations, resigned himself up to the instructions of divine wisdom. The people of Neocӕsarea, hearing of the miraculous actions of Gregory, were all ambitious to see so wonderful a man, and received him with great applause when he first arrived amongst them. But he passed unconcerned through the crowd, without so much as casting his eye on one side or another. His friends, who had accompanied him out of the wilderness, were solicitous where he should meet with entertainment. The saint asked them if they were banished the divine protection; and bade them not be solicitous concerning their bodies, but about their minds, which are of infinitely greater importance, and are to be prepared and built up for heaven. Many were ready to open their doors to so welcome a guest; and he accepted the invitation of Musonius, a person of great honour and esteem in the city, and lodged with him. That very day he fell to preaching, and, before night, had converted a number sufficient to form a little church. Early the next morning the doors were crowded with sick persons, whose distempers he cured, and at the same time he wrought the conversion of their souls. The body of Christians soon became so numerous that the saint was enabled to build a church for their use, to which all contributed either money or labour. Though churches were afterwards demolished in the days of Dioclesian, and though an earthquake threw down most of the neighbouring buildings, this escaped both dangers, and not a stone of it was shaken to the ground. St. Jerom and venerable Bede mention, that when St. Gregory built this famous church near the sea, he commanded a rock [Mountain], which obstructed the work, to yield place, which it did. The river Lycus, now called Casalmach, which passed by the walls of Neocӕsarea, falling from the mountains of Armenia, sometimes by its impetuous floods swept away inhabitants, cattle, houses, and crops. St. Gregory, moved with compassion, fixed his staff near the bank, and prayed that the waters might not exceed those bounds, and they obeyed his voice; and no such floods happened again to the time when St. Gregory of Nyssa wrote; the staff also took root, and became a large tree. Once, when the saint was upon a journey, he was espied by two Jews, who, knowing his charitable disposition, made use of a stratagem to impose upon him. One lay on the ground, feigning himself dead, and the other, lamenting his miserable fate, begged somewhat of the bishop towards his burial; who took his coat and cast it on the man that lay as dead. When St. Gregory was got out of sight, the impostor came back laughing, and required his companion to rise, but found him really dead. The miracles and wisdom of the saint brought him into such reputation, that even in civil causes, wherever the case was knotty and difficult, it was usually referred to his decision. Two brothers happened to be at law about a lake, both challenging it to belong to their part of the inheritance; nor was the saint able by words to accommodate the difference between them; but each resolved to maintain his right by force of arms, and a day was set when they were to bring into the field all the force they could raise with their tenants. To prevent unjust bloodshed, St. Gregory continued all the night before the intended engagement in prayer upon the spot, and the next day the lake was turned into solid land, whereby the contention was removed: the remains of the lake were shown long after. The saint being invited to assist at the election of a bishop at Comana, the people set their eyes upon persons honourable for their birth and eloquence, and much esteemed in the world. The saint told them, that sanctity, virtue, and prudence were more to be considered than such qualifications. Then, said one, we may take Alexander, the collier, for bishop. This Alexander was a wise and holy man, who, leaving his books, had put on the disguise of a collier in the city of Comana, where he lived by the labour of his hands. God, revealing to our saint what kind of man he was, he caused him to be brought in, and, by putting many questions to him, showed the people he was much more than he seemed to be, and that under that mean clothing was hidden great wisdom and sanctity. Then calling him aside, he obliged him to confess who he was; and having caused his clothes to be changed, gave him the people for their bishop. This Alexander discharged the episcopal office with great zeal and sanctity, and dying a martyr for the faith, is commemorated in the Roman Martyrology on the 11th of August. These miracles of St. Gregory Thaumaturgus are related by St. Gregory of Nyssa; some of them are also mentioned by St. Basil, who both lived within less than a hundred years after him, and whose grandmother Macrina, who taught them in their youth, and had care of their education, had known him and heard him preach in her younger years. In 264 a council was held at Antioch against the heresies broached by Paul of Samosata, who had been four years bishop of that city. Paul only escaped personal censures by dissembling his errors, which he afterwards renewed; and was therefore condemned and deposed in the second council of Antioch, in 270, though he kept possession of the episcopal house till after the defeat of Zenobia, Queen of the East, his protectress, in 272. Our saint seems to have passed to eternal glory in that interval; but the year is uncertain: it seems most probable to have been in 270 or 271, on the 17th of November. A little before his death, being sensible of its near approach, he inquired how many infidels yet remained in the city, and being told there were seventeen, he sighed, and lifting up his eyes to heaven, expressed his grief that any continued strangers to the true religion, but thankfully acknowledged, as a great mercy, that having found but seventeen Christians at his first coming thither, he left but seventeen idolaters. Having then heartily prayed for the conversion of the infidels, and the confirmation and perfect sanctification of those that believed in the true God, he enjoined his friends not to procure him any peculiar place of burial, but that as he lived as a pilgrim in the world, claiming nothing for himself, so after death he might enjoy the portion of a stranger, and be cast into the common lot. He peaceably resigned his soul into the hands of his Redeemer, and is named in all Eastern and Western Martyrologies on the 17th of November. Neocӕsarea, the capital of that part of Pontus, became afterwards an archiepiscopal see, and at present is called by the Greeks, Nixar (which is a corruption of its original name,) by the Turks, Tocate, and is the seat of a Beglierberg. The greatest geniuses which the world ever produced, men the most penetrating, the most judicious, the most learned, and at the same time the most sincere, the most free from all bias of interest or passions, the most disengaged from the world, whose very sanctity and perfect victory over pride and all the passions of the human mind was the most visible miracle of divine grace, and the prodigy of the world, are venerable vouchers of the truth of the divine revelation of the Christian religion, and of the evident miracles by which it was confirmed and established. Their testimony is the more unexceptionable, as they maintained it in the most perfect spirit of humility, meekness, and charity, and in opposition to every view of pride and all human interest. Yet, if we believe modern free thinkers, their party alone is that of good sense, and in proportion as a man is endowed with better understanding, and a more sublime genius, the more he is inclined to religious scepticism and incredulity. But they attempt in vain by an overbearing impudence, impertinence, and ridicule, to bring the faith of a divine revelation into contempt, and too visibly betray that pride or other base passions have corrupted their hearts; whence arise these clouds which darken their understanding. Let them impartially examine into the causes of their error, and they will find that they accuse and shut their eyes to the clearest light, because it condemns them, and that they turn infidels because it is the interest of their vices to be so. Let them correct the irregularities of their own hearts, and bring to the inquiry sincere simplicity, and a teachable mind: then all their difficulties will immediately vanish, and the evidence of the divine revelation will appear manifest. The most monstrous absurdities, evident falsehoods, glaring inconsistencies, and wretched sophistry, which we meet with in almost every line, or rather word, of their boasted writings, suffice to prove how much it is in spite of reason that they declaim, and how ridiculous their claim to it is. A submission to divine revelation authentically manifested to us, in the judgment of all who impartially consider its triumphant motives, to the eyes of reason will always appear to be the most just and glorious use that man can make of his reason. St. Gregory Thaumaturgus, pray for us.